Having a comfortable and functional work space is a necessity when working from home. You can’t focus if your space is a mess, and you can’t work efficiently if you don’t have everything you need within easy reach. Here are eight tips on making a comfortable and functional space where you can work AND play. This is really important. You will hate working if you are uncomfortable the whole time. Working on client projects when your back is screaming in agony is no fun. Trust me. I don’t mean to have to go out and spend tons of money; my chair was $80 from Costco, and my desk is from Craigslist. Hit up yard sales and discount stores to nab great pieces at great prices. If you have the option to choose where to put your desk, put it somewhere near a window with natural light (watch out for monitor glare though) or bring in some lighting so that you can see what you’re doing. There’s nothing more frustrating than straining to see what you’re working on! Deciding whether to put your office in the corner of the living room or the guest bedroom? Put it in the guest bedroom. Being able to close the door and “get away” from the dirty dishes and TV will help your productivity. And being able to shut the door at the end of the workday will let you actually have an end to your workday. If your desk is doing double-duty for both work and personal purposes, you need a great filing system. Get a filing cabinet and use separate drawers for business and personal files like bills, to ensure nothing get mixed up. I know that sounds weird, but we all get clutter and junk and random things that end up on our desks. Instead of letting these things get mixed in with your client documents or your own bills, create a space for them. When that space gets full, get it cleaned out! If you need to do something with some of that junk, then do it! Just keep it out of your actual work! And use them. Drawer organizers to keep your paperclips, a cup to hold your pens, binders and file folders to hold your documents. Whatever you need, get it, and use it. You don’t want to spend 10 minutes hunting through your drawer every time you need a rubber band. That will get old really fast. It’s better to invest $10 on a drawer organizer so that you can keep everything at your fingertips. If you’re messy, plan to spend 15 minutes every week straightening up your drawers so that they stay organized. Schedule it in. Make your work space somewhere you want to spend time! Put up some artwork, color coordinate your office supplies, and create inspiration boards related to your work. Spend the last few minutes of your workday straightening up your desk and putting things away. Don’t leave your work spread out everywhere. Remember, if you’re sharing this space or using it for personal time (blogging/Pinteresting/etc.) you don’t want work documents left out to get lost or distract from your own time. You also don’t want to “go to work” in the morning at a messy desk! Putting your work away at the end of the day helps you “log out” of work, and helps prevent you from mixing your work and play times. 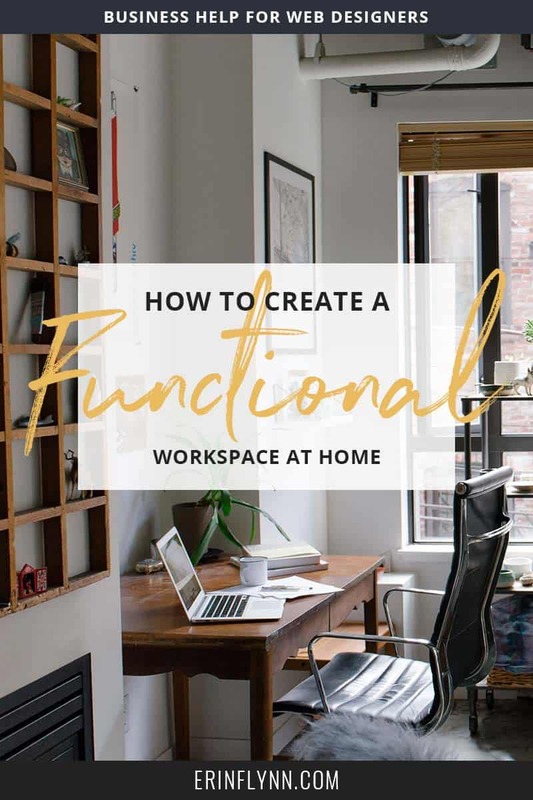 A functional and comfortable work space will make working at home easier and more enjoyable!